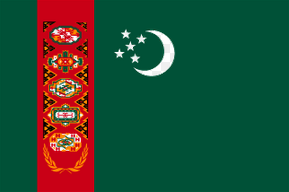 The national flag of Turkmenistan is known as one of the most detailed flags in the world. Turkmenistan declared its independence from the Soviet Union in 1991 and since then little remains known about this country. During its transition from Soviet rule Turkmenistan has muted its people’s outcry for political reform. The government’s disregard for its citizens’ needs has resulted in a drastic change in political participation arising from various cultural issues. Broken promises of democracy taint this country and its people with no signs of improvement. Turkmenistan rates 178 out of 180 in Reporters Without Borders 2015 World Press Freedom Index based on occurrences such as the imprisonment of journalists and the governments’ blatant disregard for its first media law. The International Freedom of Expression Exchange shed light on the oppressive censorship happening in Turkmenistan, for instance the case of the human rights activist who was confined in a psychiatric hospital for talking to a radio station. With the disguise of democracy this country continues to censor and oppress freedom of the press, freedom of speech and overall human rights. Turkmenistan is the second largest country in Central Asia after Kazakhstan. Bordered by some of the most violent areas of the Middle East including Iran, Afghanistan, and Uzbekistan, Turkmenistan has a coastline along the Caspian Sea, which is the largest landlocked sea in the world. In contrast, Turkmenistan is also known as the driest country in Central Asia because of the Kara-kum black sands desert, which covers about 80% of the territory. Furthermore, Turkmenistan is also home to a beautiful mountainous range with Mount Ayribaba being the highest peak in the country. The area has seen an influx of tourism over the last decade due to its variety of astonishing architecture and archaeological sites. This country is praised for the beauty of its capital Ashgabat, which is home to one of the largest mosques in Central Asia, the Kipchak Mosque. Similarly, Turkmenistan is the site of some of the oldest mosques in the world such as the Seyit Jemaletdin Mosque. Its early leader Saraparmurat Niyazov named Turkmenistan the “New Kuwait” because it is a rich resource for oil and natural gas. The country has accounted for oil reserves of 546 million barrels and gas reserves of 260 trillion cubic feet. These statistics have made Turkmenistan the seventh largest gas reserve in the world, with most of its resources being exported to Russia with recent expansion to China and Iran. Turkmenistan is widely known to have an autocratic government governed by the Democratic Party of Turkmenistan. In 1994 the country officially fell into the eccentric power of Saraparmurat Niyazov when parliament agreed, at his suggestion, that they nominate him president until 2002. Moreover, parliament decided they would allow him to be president for life. Niyazov took it upon himself to impose a bizarre personality cult in the country. From the beginning of his term Niyazov wanted his country to have a permanent sense of his reign and power. He had his image placed throughout the city streets and had golden statues of himself erected throughout the country, the most notable being a rotating statue on top of the capital of Ashgabat. He also changed the names of the months to honor his family members. Despite his weak reading and writing abilities Niyazov wrote a book called the Ruhnama, which was full of spiritual teachings, early history of the country, and was regarded as a holy book. A statue of the Ruhnama was placed in the capital of Turkmenistan along with a daily audio presentation of Niyazov’s teachings. There is no doubt that countries in Central Asia have some of the most oppressive regimes in the world, still Niyazov’s regime is regarded as one of the most uniquely repressive and dictatorial. His regime included the banning of political parties, the exile of religious and political opposition leaders, and full government control for any and all media outlets. Niyazov’s reign ended when he died of a heart attack on Dec 21, 2006. His successor, Gurbanguly Berdymukhammedov, was the vice president of the ministerial cabinet and had been a strong asset to Niyazov’s entourage. Berdymukhammedov was elected president in the election of 2007, in which multiple candidates were allowed to run for the first time in the country’s history. Berdymukhammedov won by 89 percent of the vote while none of the other five candidates received more than 5 percent of the vote. Since the beginning of his term the political regime of Turkmenistan has slightly improved but has not fully dismissed authoritarian rule. Berdymukhammedov began his regime by purging the government of most of Niyzov’s loyal politicians and high state employees. He enacted a new constitution in September 2008, which gave citizens the right to start their own businesses, along with improvements of educational rights, and most importantly the implementation of a judiciary system comprised of a Supreme Court, six regional courts and sixty-one district courts. With the people regarding their new president as the “dear son of the Turkmen people” it is obvious that he has shifted the country from a Niyazov personality cult to a Berdymukhammedov personality cult. The new president has repeated similar actions of his predecessor, for example, displaying his image around the city streets, and his writings being added to school curriculums. The constitution of Turkmenistan states that citizens have freedom of speech but it is well known that the government does not uphold this promise. While the country has seen more obstruction of freedom of the press, it has experienced regulation for speech as well. The government validates their freedom of speech oppressions by fabricating false situations to punish any dissidents they feel are speaking out of place. They implement arbitrary systems, and false accusations to give the impression of a democratic government that is rightfully punishing its rebellious citizens. International commentaries from surrounding countries such as Europe regard the Turkmen government as shameful and negligent. Although none of these regulations remain active, the early limitations on speech have had a great impact on Turkmenistan’s current legislation. Turkmenistan’s early president, Niyazov, made a point to eliminate all independent academic and artistic expression. In 2001, he ruled that ballet, opera, and classical music were not to be part of Turkmen culture, stating it was “against the spirit of the Turkmen people.” He also targeted literature, in which he blacklisted several Turkmen authors, removed their books from public reach, and from all school curriculums. A more recent scenario that took place under the current president’s rule involves Farid Tukhbatullin, a human rights activist from Turkmenistan, who was imprisoned and exiled from the country for his work, which involved political opposition. Not only has his work affected him personally but it has also affected the life of his family that remains in Turkmenistan. His brother, Rusian Tukhbatulum, had plans to travel to Istanbul to visit Farid but was told that he was entirely banned from any foreign travel by the Turkmen government. While it was clear that he was being punished by association, the government fabricated a lie as to why he had to stay in the country. They insisted that he was of interest to the Turkmen army and was possibly going to have to re-enlist. Yet the government had continuously tormented his family with interrogations about his brother and threats of being punished for treason. The Turkmen government uses unofficial systems to prevent foreign travel for anyone who speaks against the government; even if you are associated with someone who works as an activist you may become a target. Rusian Tukhbatulum is still banned from foreign travel; his brother remains in exile. Another recent regulation involves the enactment of a new Internet statute, which contains eight chapters and thirty-four articles. The government stated that the main objective of this statute was to expand the people’s Internet access, to define legal limitations the government will place on the Internet, to prevent any socially or politically dangerous acts from being committed on the Internet, and ultimately to be able to punish those who commit any online offenses. There is a long list of limitations in this new statute that thoroughly deny the Turkmen people of their freedom of speech. First, the statute states that all users are responsible for the truthfulness of the content they post online. Not only must they post honest information, they are also held liable for posting any wrongly defined propaganda of violence or cruelty. Similarly, users cannot post information advocating war or violence in the country. They cannot share or view information that promotes racial, ethnic or religious animosity. The statute also strictly prohibits any posting or viewing of information that speaks of constitutional reform or discredits the president. The government also restricts Internet users from posting or viewing any content that promotes minor drug use, rejects family values and the posting or viewing of pornographic material. The Communications Ministry can closely regulate the Internet because it is the only Internet provider. Since its enactment in 2014 there has been no recorded cases of citizens being tried under this statute. Other invasions of free speech include the government interception of mail before delivery, as well as requiring that any mail being delivered to the post office must remain unsealed for government inspection. The education system is also regulated in that students cannot criticize government policy or the president. They also may not conduct research on topics that are considered politically or religiously sensitive. In Turkmenistan any and all reforms for the freedom of the press are considered dead letters. Since independence, all media organizations have been completely controlled by the government. The government created the Turkmen State Agency and it has remained the only information agency that journalists can obtain their information from. Due to the fact that all forms of media are pro-government and poorly produced the Turkmen people have shown little to no interest in using the media as a resource for information. Under the rule of Niyazov it was illegal to report anything the president considered to be “bad news.” This included news on food shortages, bad harvests, government cruelty, and prison brutality. Anything that could damage the reputation of the Turkmen culture was off limits. Shortly after the death of President Niyazov, two journalists, Annakurban Amanklychev and Sapardurdy Khadjiyer, were imprisoned for helping the Galaxie-Presse, a French TV production company, obtain information for a documentary they were making on Turkmenistan. The journalists were imprisoned for seven years under hopeless conditions in a prison located in the extremely hot desert of west Turkmenistan. Originally three journalists had been arrested but Ogulsapar Muradova died after he was brutally beaten by prison guards. Their trial was held in secret and they were said to be sentenced to jail for possession of illegal firearms and ammunition to avoid the criticism of the government’s repressive regulation. In 2013 President Berdymukhammedov accidentally fell off his horse in front of a large audience after winning a prestigious horse race. The incident was caught on tape by a bystander and managed to spread on the Internet. Turkmenistan media reported on the race but was only allowed to report on the president’s victory. The race was shown on television but cut off right before the president’s embarrassing fall. The incident had caused conflict in the capital and government officials were determined to stop the spread of the video but had little success. There are many drastic differences between Turkmenistan and the United States. Both countries claim to rule through a system of democracy but only one actually fulfills this claim. The United States is ranked 49 out of 180 countries in the 2015 World Press Freedom Index, which is significantly higher than Turkmenistan has ever managed to rank. In terms of freedom of speech, the United States would never allow the unlawful imprisonment of human rights activists the way the Turkmen government has done to Farid Tukhbatulum. On the contrary, the United States encourages citizen activism of all issues and creates an open platform for all kinds of debate. The United States government would protect the work of activists and would not question his family or prohibit them from traveling abroad because that would be considered an abuse of power from the government. If we analyze the Tinker v. Des Moines case, which presents similar citizen activism, under the laws of Turkmenistan the students and their families would be exiled from the country or sentenced to imprisonment for expression of political opposition. On the other hand, in the United States the students were within the free speech and expression protections guaranteed in the First Amendment. Similarly, Turkmenistan’s Internet law would be crushed if analyzed under strict scrutiny in the United States for its overly oppressive limitations on freedom of speech and privacy. As we saw in United States v. Alvarez, the First Amendment even protects speech that is false, this is unheard of in Turkmenistan as all citizens are expected to publish and express themselves honestly in all exchanges. In regard to freedom of the press the United States and Turkmenistan contrast each other in many ways. The United States is home to thousands of private media outlets; whether it is press or television all Americans can rest assured that their news is produced professionally, and open for debate of various topics with very few limitations. On the contrary, press in Turkmenistan is limited to work with what the government allows them to express to the public. This has deterred public debate in Turkmenistan and ultimately has deprived the Turkmen people of knowledge they have every right to know. As the United States Supreme Court determined in New York Times Company v. United States, prior restraint is almost never justified under the First Amendment, much less the imprisonment of journalists who are doing their job. There would be an uproar from American citizens if the United States government imprisoned journalists for sharing information about their country. Especially if they were tried in a secret trial and ultimately punished under false accusations, yet in Turkmenistan it is more important to remain secretive and dictatorial than it is to be honest and fair with their citizens. If President Barack Obama happened to fall off a horse at a public event, it would be extensively shared online, on television, and in newspapers all over the country. The United States press would report on the president’s victory but they would not leave out him falling off a horse because that is simply part of the story. Turkmenistan limits free speech in the same manner as the United States Sedition Act of 1918, in which government forbade traitorous speech against the government or any acts of government. These two countries differ greatly because the Turkmen government insists on controlling and regulating rights that Americans see as the most deserving, and precious of rights guaranteed by the First Amendment. Turkmenistan remains in a state of unfulfilled social progression in which the government continues to disguise their oppression with the promise of democracy. The Turkmen government appears to be stuck in the authoritarian ways established by its early president, Niyazov, whose regime left an everlasting impression of a cult-like country. With continued restrictions on speech being implemented as technology forces its way into the country and little to no freedom for the press to report and investigate without bias; there is slight hope for the advancement of Turkmenistan. In contrast, the United States continues to progress into a democracy to allow the most freedoms for speech and press to guarantee an undeniable platform for fair, and unbiased debate amongst its citizens. “2015 World Press Freedom Index.” 2015 World Press Freedom Index. N.p., n.d. Web. 14 Apr. 2015. The Concise Encyclopedia of Democracy. Washington, D.C.: CQ, 2000. Print. “Country’s First Media Law Starts Life as Dead Letter – Reporters Without Borders.” Country’s First Media Law Starts Life as Dead Letter – Reporters Without Borders. N.p., n.d. Web. 14 Apr. 2015. Craggs, Ryan. “Gurbanguly Berdymukhamedov, Turkmenistan President, Falls Off Horse During Race (VIDEO).” The Huffington Post. TheHuffingtonPost.com, n.d. Web. 14 Apr. 2015. Human Rights Report 2013. N.p. : US Department of States Bureau of Democracy, Human Rights, and Labor, 2013. Print. Country Reports on Human Rights Practices for 2013. “IRIS 2015-2:1/32.” Turkmenistan : New Act to Regulate the Internet. N.p., n.d. Web. 14 Apr. 2015. “New Turkmen Internet Law Criminalizes Insulting President.” RadioFreeEurope/RadioLiberty. N.p., n.d. Web. 14 Apr. 2015. “The Personality Cult of Turkmenbashi.” The Guardian, 21 Dec. 2006. Web. Peyrouse, Sébastien. Turkmenistan: Strategies of Power, Dilemmas of Development. Armonk, NY: M.E. Sharpe, 2012. Print. Rashid, Ahmed. Jihad: The Rise of Militant Islam in Central Asia. New Haven: Yale UP, 2002. Print. The Shadow of the Holy Book. Dir. Arto Halonen. Theshadowoftheholybook.net. N.p., 29 Feb. 2009. Web. “Shadow of the Ruhnama – The New Yorker.” The New Yorker. N.p., 27 Apr. 2010. Web. 14 Apr. 2015. “Turkmen Leader Backs Moves towards Private Media.” BBC News. N.p., n.d. Web. 14 Apr. 2015. “Turkmenistan: Activist’s Family Barred from Travel Abroad – IFEX.” IFEX. N.p., n.d. Web. 14 Apr. 2015. “Two Journalists Freed after Seven Years in Prison in Appalling Conditions – Reporters Without Borders.” Two Journalists Freed after Seven Years in Prison in Appalling Conditions – Reporters Without Borders. N.p., n.d. Web. 14 Apr. 2015.